The rivalry began in 1878, when Borden disrupted a fraudulent séance conducted by Angier and his wife, Julia, but neither could then have imagined how long and bitter it would ultimately be. Stretching into the early years of the 20th century, it waxed and waned as their fortunes rose and fell, ranging from harmless pranks to life-threatening interruptions of their stage performances. Borden’s book, Secret Methods of Magic, sheds some light on their feud, yet its cryptic notations raise as many questions as they answer, and only Angier’s own journal can complete the puzzle. Desperate to unlock Borden’s secrets and retaliate against his periodic attacks, Angier hits upon an unholy mix of science and magic, which brings him unprecedented fame and financial reward. The cost is incalculably high, not only to Angier himself but also to both families for generations to come, and involves Andrew’s very existence in a way that the final terrifying truth will reveal. Soon to be a major motion picture from director Christopher Nolan (Memento, Batman Begins), this 1995 novel won the World Fantasy Award and Britain’s James Tait Black Memorial Prize. Christopher Priest, praised by John Fowles as “one of our most gifted writers,” is the author of the novels Indoctrinaire (1970), Fugue for a Darkening Island (1972), Inverted World (1974), The Space Machine (1976), A Dream of Wessex (1977), The Affirmation (1981), The Glamour (1984), The Quiet Woman (1990), The Extremes (1998), and The Separation (2002). The winner of the Arthur C. Clarke and BSFA Awards and Grand Prix de l’Imaginaire, he has also written non-fiction and the collections Real-Time World (1974), An Infinite Summer (1979), and The Dream Archipelago (1999). He lives with his wife and their two children in Hastings, England. Historic and literary “family feuds” range from Shakespeare’s Montagues and Capulets to the Hatfields and McCoys. Could the Angiers and Bordens have ended theirs at some point, or was it predestined to continue through the years? Must the sins of the fathers be passed to other generations? Did the feud join the families as much as it separated them? The use of the ampersand (&) instead of the word “and” is one way in which the author differentiates between the two “voices” in Borden’s book. What are some others? Do such devices make the story easier to comprehend, or confuse the reader even further? Noting that Angier’s clients derive genuine comfort from his fraudulent séances, Borden asks, “Was any of this so different from the pleasurable mystification a magician gives to his music hall audience?” Do you agree? Do such séances help or hurt the participants? Borden recounts the story of Ching Ling Foo, who affected a shuffling gait onstage and off to protect his greatest illusion. To what lengths does Borden go to conceal the secret of The New Transported Man? Does he lie to himself, as well as to the outside world? 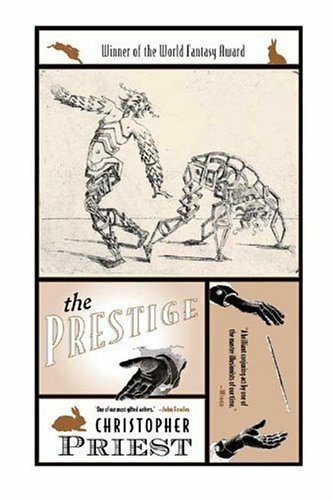 The Prestige exemplifies Priest’s self-described “fascination with doppelgangers and twins.” What are some of the ways in which this theme is incorporated, either overtly or subtly? Do you see Angier and Borden as opposite sides of the same coin? Classics like Alexandre Dumas père‘s The Corsican Brothers depict twins as having a unique, almost telepathic bond. Do you believe that such a bond really exists? In what ways does Priest play with the traditions and expectations associated with this concept? As in Akira Kurosawa’s film Rashomon, Priest sometimes depicts the same events from multiple perspectives, especially the incident that sets the feud into motion. Did you trust one account more than the other? Why? Does subjectivity always affect our perception? Priest uses real-life electrical pioneer Nikola Tesla (1856-1943) as a character, depicting him as a bitter rival of Thomas Edison’s. Does Priest portray Tesla accurately? Does the use of such historical figures make a story more believable for you, or is it a distraction? Angier calls Tesla “a prophet of what the next century will hold for us.” How does Priest use the turn of the century as a backdrop? Do his characters adapt well to such changes? The forthcoming film version of The Prestige stars Hugh Jackman and Christian Bale as rival magicians Angier and Borden. With its complex structure and multiple—sometimes unreliable—narrators, does the novel naturally lend itself to adaptation in the first place? How might a screenwriter alter or compress the story to turn the book into a viable script?